Want happy plants and a healthy lawn? Get a soil test! Finally, spring seems to have sprung in Minnesota! 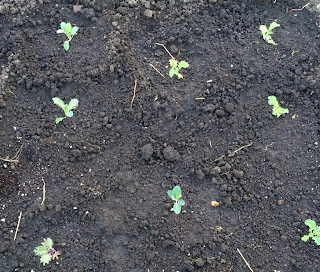 The soil is rapidly warming across much of the state, and it'll be time to plant before we know it. Before you put anything in the ground, however, you should consider testing your soil so you know how best to prepare for planting. The only reliable way to determine how best to fertilize is to do a soil test. What's a soil test and why do it? A soil test provides information specific to your lawn or garden. You can save time, money, and angst by receiving lime and fertilizer recommendations based on your soil and what you want to grow - no more guessing! By applying only what's needed, you will also minimize any adverse environmental impacts from fertilizer use. Excess soil nutrients contribute to problems such as algal growth in lakes (too much phosphorus) or nitrate in groundwater (too much nitrogen). 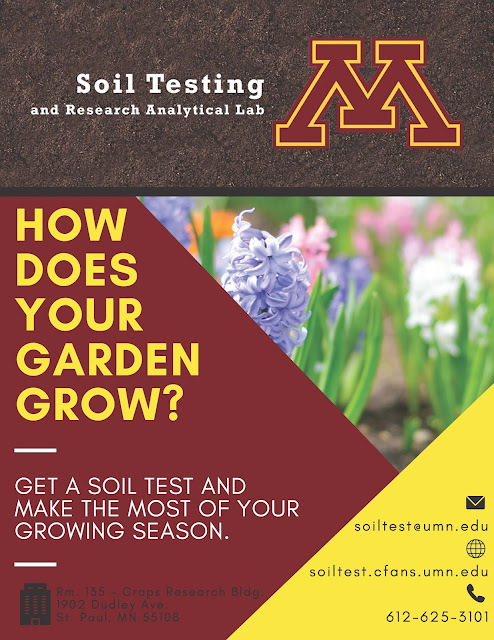 And while you can buy home soil test kits, they are not calibrated to the soil characteristics we have in Minnesota, nor do they provide recommendations specific to your situation. 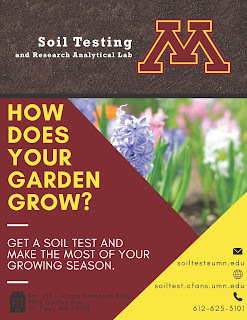 The University of Minnesota Soil Testing Laboratory offers soil tests for lawn and garden and provides recommendations based on what you want to grow in your soil. The regular lawn and garden soil test ($17) will give you estimated soil texture, organic matter, phosphorus, potassium, pH and lime requirement. The analysis will also come with a basic interpretation of results and recommendations for fertilizing your lawn or garden based on what you want to grow (e.g. vegetables? flowers? fruit trees?). For an additional fee, you can also test and receive recommendations for lead and/or soluble salts (from excess fertilizer or road salt). A full list of available tests can be found here. What makes a good soil test? However, the soil test is only as good as the sample. When collecting your soil sample, you want it to truly represent the growing area of interest. You may want to submit more than one sample if you have a very large area or different uses within your yard (e.g. vegetable garden and lawn). Be sure to read these instructions for sampling before heading out with your spade and bucket! You'll need to take several samples, combine them in a bucket, mix well, and submit about a pint of mixed soil to the lab for testing. Once you have your sample, place it in a tightly sealed container or bag. Print and fill out the Lawn & Garden Submission Form and enclose it with your sample and check. The sample can be mailed to the lab or delivered in person. The Soil Testing Lab's website is updated to reflect current soil testing turnaround time, so you know when you can expect your results. And as always, if you have questions, contact either the Soil Testing Lab or your local Extension office for assistance.